WIRELESS is a somewhat outdated word used to describe a radio, but in a “back to the future” scenario, it represents the way ahead on the world stage for one of our local hightech companies. 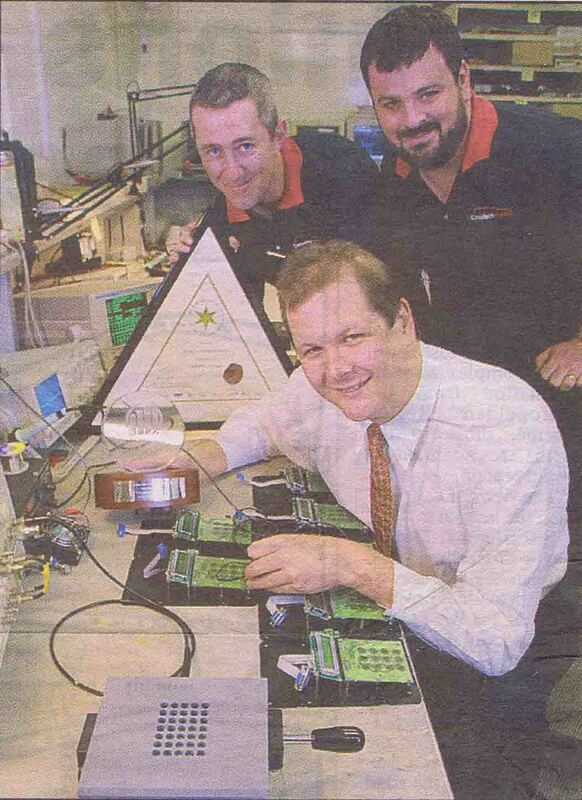 Commtech Wireless, of Osborne Park, has just won two categories in the 2002 Industry and Export Awards, including the C.Y. O’Connor Award for Excellence in Engineering and Technology. It also won the Emerging Exporter Award. Commtech chief executive Nathan Buzza described the awards as recognition of the high growth year the company had just achieved. “Growth over the past eight years has averaged 60 per cent a year,” he said. Commtech was one of four City of Stirling companies which won five of the 13 category awards. The major award, the Premier’s Award for Excellence, went to West Perth company Lasata Software for its multifaceted global marketing strategy to promote its Vision Financial Management Software. 1. Q-Mac Electronics, of Osborne Park, Small to Medium Manufacturers Export Award. 2. P.B. Foods, of Balcatta, Agribusiness Export Award. 3. Mt Romance Australia Pty Ltd, of Glendalough and Albany, Regional Exporter of the Year Award. Commtech’s communications software has revolutionised the way businesses send messages and the power of its BASEPage 2000 technology, which seamlessly integrates all types of text messaging, has attracted business from around the world. Commtech made its first overseas sale less than three years.ago and last year exports to more, than 20 countries accounted for 21 per cent of revenue. It now has a distribution channel of more than 240 partner companies worldwide. The company also has offices in Melbourne and Sydney and in 2001, partner Zane Lewis opened an office in Florida. Despite September 11, it achieved growth sales of $2 million in its first year. “We have just secured a $600,000 contract to outfit all hospitals in Riyadh, Saudi Arabia, with wireless-messaging equipment and we are hoping to secure another $1.2 million contract with the Saudi Electricity Commission to establish a wirless network to one-third of the country,” Mr Buzza said. The company employs 35 staff at its four offices, with 22 at the Osborne Park office. Q-Mac electronics’ award is attributed to the Q-Mac HR-90 radio receiver, which can achieve ranges of up to 3000km without satellites or cell—phone towers. It is attracting defence and military buyers in more than 75 countries. Suitable for man-pack, mobile and base installations, the HR-90 offers high—power, lower-cost and secure communications. The company has had consistent annual growth in sales revenue of about 20 per cent. Peters and Brownes (PB Foods) won the agribusiness export category for its wideranging export strategies, which are making inroads into major Asian markets. Mt Romance, whose main base is in Albany, has achieved an annual 100 percent growth in export sales of its sandalwood oil products over the past three years.